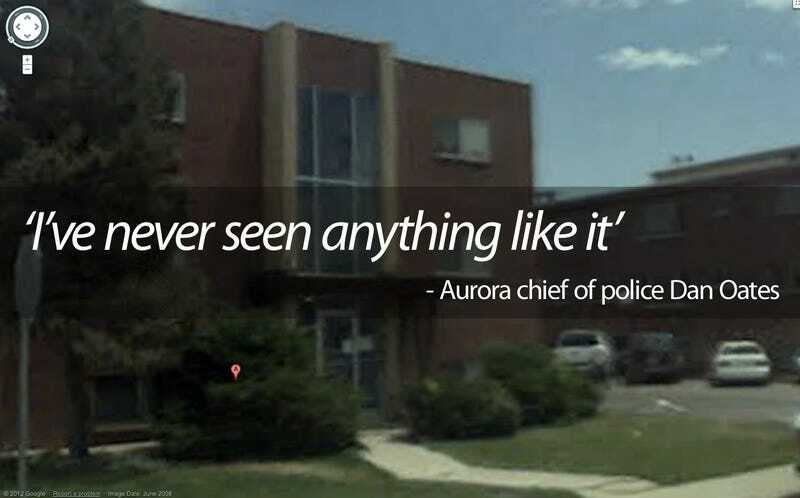 Details about the booby traps that James Holmes set up at his house are scarce but at a press conference that ended just a few minutes ago, the Aurora Police Chief, who used to work for the NYPD mind you, said they were "Something I've never seen." He said it appeared to be some sort of incendiary device, that there where chemicals involved, and "lots of wires." The police are still trying to figure out how they are going to get into the apartment, and they've evacuated his entire building and five more in the area. According to the Denver Post, the local fire chief said that the tripwires in Holmes' apartment were connected to bottles which contained "unknown substances." According to one report, an FBI agent, "The pictures are pretty disturbing as far as how sophisticated it is. This could be a very long wait." FBI agents and police used a hook-and-ladder fire truck to reach Holmes' one-bedroom apartment on the third floor, said Oates. By hoisting a camera at the end of a 12-foot pole through a window, officers were able to get a view inside.